Researchers at India's Institute of Nano Science and Technology (INST) have developed a new route for the scalable preparation of large area few-layer graphene from waste biomass (nutshells) for high-performance energy storage devices. The team's objective of using biomass-waste is not only to solve the problem of waste recycling but also to generate value-added materials like conductive graphene for renewable energy storage devices such as supercapacitors. The Peanut shell-derived graphene is said to possess remarkably high specific surface area (2070 m2 g−1) and excellent specific capacitance. This method is reportedly scalable, renewable and cost-effective. The resulting electrodes based on the nutshell-drived graphene exhibited a high specific capacity of 186 F g−1 without the use of any binder in 1 M H2SO4 as supporting electrolyte. The highest energy density of 58.125 W h Kg−1 and highest power density of 37.5 W Kg−1 was achieved by the material. Surprisingly, the working potential increased to 2.5 V in an organic electrolyte leading to an obvious increase in the energy density to 68 W h Kg−1. 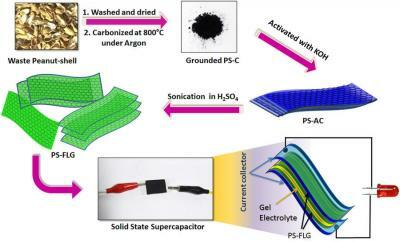 Solid-state-supercapacitor was fabricated with this material for the possible use of low-cost, high energy promising energy storage device. The researchers in this study have developed a new approach for the synthesis of few-layered graphene from no-value biomass waste peanut shell without using any graphitizing agents. The PS-FLG material is suitable for application in supercapacitors. The team also synthesized walnut shell and almond shell derived carbon for comparison purpose, and the PS-FLG possesses approximately four times more specific capacitance than WS-C and two times more than AS-C.